A Taiwanese medical researcher at a Taipei military hospital has contracted the Sars virus. Taiwan health officials say the man, 44, might have contracted the pneumonia-like disease on 5 December during an experiment on Sars. It is the island's first case since it was dropped from a global list of Sars-infected areas in July. Sars killed over 800 people and infected as many as 8,000 in a world-wide outbreak earlier this year. Taiwan had recorded more than 300 cases of Severe Acute Respiratory Syndrome and 37 people died directly from the virus, according to the World Health Organisation (WHO). Around the same number of deaths in the country were related to Sars. The infected researcher had been studying Sars at the National Defence University, according to a statement issued by Taiwan's Centre for Disease Control (CDC). "Right now, he's the only one who's been infected," Taiwan's Health Minister Chen Chien-jen told reporters at a news conference on Wednesday. Health officials said the researcher attended a conference in Singapore for four days earlier this month and developed a fever on 10 December after returning to Taiwan. Initially he thought he had the flu, but X-ray examination on Tuesday showed he had pneumonia. He was then tested for Sars and the results were positive. Television stations showed footage of the man being transported to Taipei's Hoping Hospital in a special ambulance. Authorities in Singapore said that so far there were no signs that the Taiwanese researcher had infected anyone there, but an investigation has been launched. 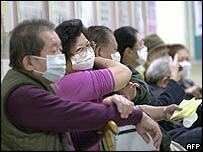 Taiwan was badly affected by the Sars outbreak earlier this year, the BBC's Louisa Lim in Beijing says. Hospitals failed to manage infected patients properly and the virus spread quickly. Sars is believed to have originated in southern China in November last year. Researchers have warned it could return in the cooler winter months.